Vigo County Public Library board members on Monday night voted to accept a grant of $19,866 to place 80 years of microfilm newspaper archives in a digital format, meaning it will be available on the Internet in just a few months. The newspapers to be “digitized” will include multiple Terre Haute papers dated from 1825 to 1905, said Kristi Howe, library director. Once the work is completed, the newspapers will be available on the VCPL, Wabash Valley Visions and Voices and the Indiana Memories websites. The prophetic message drew chuckles — and knowing nods — from guests attending the Wabash Valley Visions and Voices 10th Anniversary dinner. 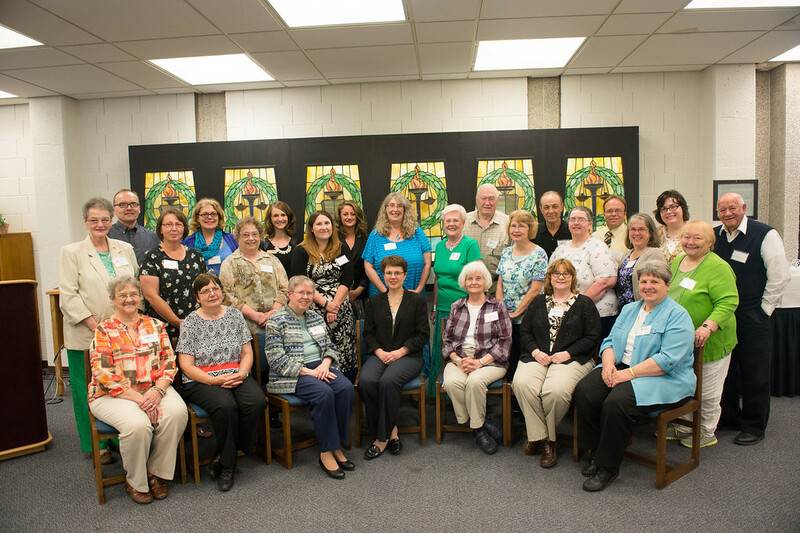 The 50 honorees recognized during the Monday night event at Indiana State’s Cunningham Memorial Library are part of a collaborative effort spanning six counties. WV3, as it is known, includes West Central Indiana’s libraries, museums, cultural organizations and community groups that work to preserve the region’s history in print, image and sound. “We offer you thanks for hitting the save button,” said Gregory Youngen, interim library dean. Youngen’s thank you was among the evening’s numerous appreciative words. In 10 years, WV3 accomplished more than they ever thought was possible, amassing more than 160,000 items from 21 partners and 44 collections, said Cinda May, special collections chair at the library and project director of WV3. She offered a champagne toast to the “folks who made it all possible — past, present and future.” The group also welcomed its “first partner of the second decade,” the Merom Conference Center, which dates back to 1865, when it was the Union Christian College. In 2004, the technology landscape was much different than it is now — Bluetooth capability was new, the now obsolete TiVo was all the rage and iPhones had not yet been invented. So, creating the state’s oldest ongoing collaborative digitization project took nearly a planetary alignment, May said. 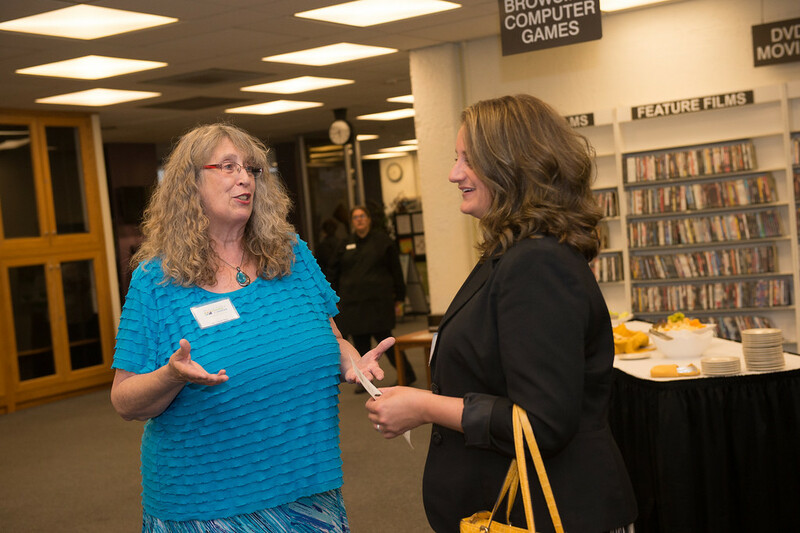 Myrna McCallister, who was dean of the library in 2004, developed the idea of a collaborative project, and May created the concept of a digital memory project focused on local history and culture. WV3 has always been based at Indiana State, which provides server capacity, resources and staff. After a decade, the university remains just as committed to WV3, because of the experiential learning and community engagement it provides. Good citizenship is an expectation in a democracy, Bradley said, and the university strives to lead by example with its community engagement activities. “ISU is engaged with our community, because we want to be part of the Wabash Valley, not just located in the Wabash Valley,” Bradley said. At the start of the function, the partners posed for a group photo, which will fittingly be digitized for posterity: city of Terre Haute, Clinton Public Library, Coal Town and Railroad Museum, Educational Heritage Association, Eugene V. Debs Museum, Indiana State University, Knox County Public Library, Little Italy Festival Town Inc., Lost Creek Grove Preservation and Restoration Foundation Inc., Native American Museum, Princeton Public Library, Rockville Public Library, Rose-Hulman Institute of Technology Logan Library, Rural Community Academy, Saint Mary-of-the-Woods College, Sisters of Providence of Saint Mary-of-the-Woods, Sullivan County Historical Society, Sullivan County Public Library, town of Seelyville, Vigo County Historical Society, Vigo County Public Library and Wabash Valley Genealogy Society. To access the free digital collection of artifacts, administrative and personal papers, manuscripts, photographs, texts, yearbooks, maps, oral histories and other audio/video files, go to http://visions.indstate.edu. Photos: Partners of the Wabash Valley Visions and Voices pose for a photograph at the 10th Anniversary dinner at Indiana State’s Cunningham Memorial Library Monday night. 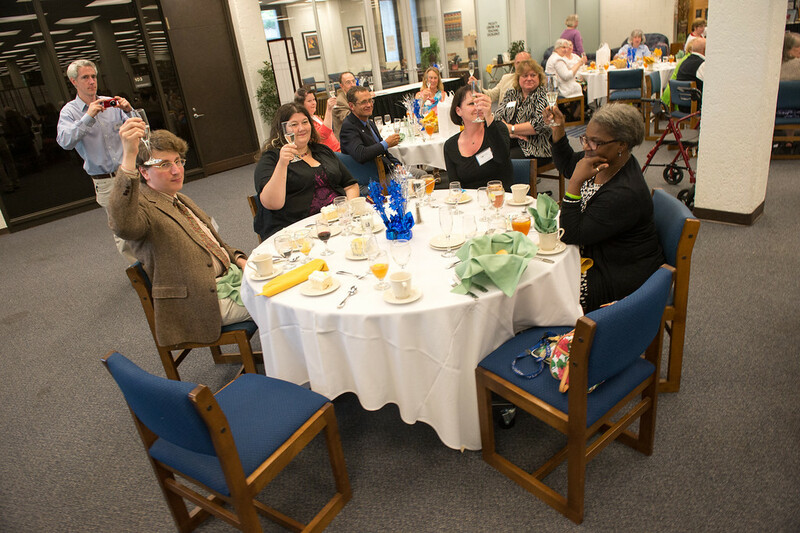 Guests raise their glasses in a toast to the accomplishments of Wabash Valley Visions and Voices Digital Memory Project. Residents are invited to have their personal pictures and documents digitized at a COMMUNITY SCAN DAY, Rockville Public Library (106 N. Market St.), June 21, 10am – 2pm. This is free. Rockville Library is a partner of the Wabash Valley Visions & Voices Digital Memory Project, a collaborative effort of west central Indiana libraries, museums, cultural organizations and community groups spanning six countied. WV3 works to preserve the region’s history in print, image and sound. In the past 10 years the organizations has amassed more than 160,000 items from 21 partners and 44 collections. While much of WV3’s collection includes artifacts, hotographs and documents from the distant past, the partners are also interested in recent history, such as modern and digital documents and photographs. For more information about the project: 765.569.5544. • May 3: Sullivan County Public Library/Historical Society Scan Day in Carlisle, 10 a.m. to 2 p.m.
• May 24: Vigo County Public Library/ Wabash Valley Genealogy Society at the library, 1 to 4 p.m.
• June 7: Knox County Public Library Scan Day in Vincennes, 10 a.m. to 4 p.m.
To access a free digital collection of artifacts, administrative and personal papers, manuscripts, photographs, texts, yearbooks, maps, oral histories and other audio/video files, visit visions.indstate.edu. See also article in Tribune-Star about 10th anniversary of Wabash Valley Visions and Voices. Tuesday, April 22 has been declared Wabash Valley Visions & Voices Day. Event at Vigo County Public Library, 5-8pm. Project spans 10 years, 6 counties, working to preserve the region’s history in print, image and sound. For full article, see Tribune-Star article. Indiana State University’s Cunningham Memorial Library has 1 open tenure track faculty position, Data Curation Librarian. Join an exciting campus community. Enrollments are up, we have just completed a successful comprehensive fundraising campaign, and we have been designated a “Best in the Midwest” for the tenth consecutive year by Princeton Review. ISU was ranked first in community service among 281 national universities in Washington Monthly magazine’s college guide and ranked second in the nation for support of service learning. ISU has a strategic goal to employ and retain highly qualified staff and faculty from underrepresented groups. Our city, a regional hub for commerce, arts, sports, cultural events, and medical services, received the “Indiana Community of the Year” award in 2010. The Library is at the heart of this exciting campus of more than 12,000 undergraduates and graduates. Our motto is “Your campus living room,” and that is what we strive to be—the gathering place for campus. We offer many resources for our users including more than 1.3 million items in our collection including 140,000 e-books and 71,000 e-journals/databases. Our Special Collections houses the Warren N. and Suzanne B. Cordell Collection of Dictionaries, one of the largest such collections in the world. In addition, we offer many services including the Math/Writing Center and Commuter Lounge as well as excellent reference and instruction services, Interlibrary Loan, and e-Reserves. Offering opportunities to attend unique and rewarding programs, last year the library hosted 122 events that attracted over 24,000 attendees. The Library is committed to serving as the academic and research heart of the Indiana State University. Data Curation Librarian – This 12-month, tenure-track position provides technical leadership for the creation, management, preservation of and access to digital assets and scholarship. The incumbent will manage, develop and migrate digital application systems and serve as webmaster for digital initiatives’ websites. The successful candidate maintains and develops Sycamore Scholars, the institutional repository for Indiana State University, manages the Electronic Theses and Dissertations program, and works closely with faculty, students and the College of Graduate and Professional Studies. S/he provides technical support for library and campus digital initiatives including the Wabash Valley Visions & Voices Digital Memory Project; University Archive’s implementation of Archon; the Art Department’s MDID based slide library, and other digital projects; and is actively engaged in data wrangling and systems administration tasks in support of the Library’s participation in the MetaArchive Cooperative Preservation Network. The successful candidate will be responsible for the identification, adaptation and implementation of appropriate digital repository technologies and will possess the ability to interact effectively with library colleagues, Office of Information Technology professionals, teaching faculty, and students. S/he will technically lead the migration of the digital library collections from CONTENTdm to an open source repository solution. In addition, the incumbent will serve as the web master for Wabash Valley Visions & Voices, a collaborative regional digital repository and be involved in addressing digital preservation issues related to this and other digital initiatives. The Data Curation Librarian will also liaise with the Metadata Librarian as needed. Responsibilities may include travel to other locations to provide training, and participation in evening and/or weekend special events. ISU librarians are expected to participate in university and library governance and to engage in professional activities, including research and publication, in order to attain tenure and promotion. This position reports directly to the Chair of the Special Collections Department.